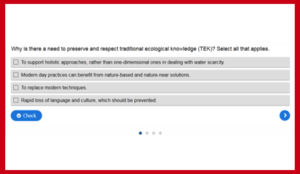 Traditional Ecological Knowledge (TEK) refers to ecological knowledge and practices of indigenous and local cultures. 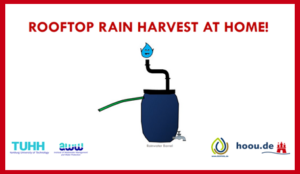 With a focus on Rainwater Harvesting (RWH) many different types of systems were designed based on scale, water usage and storage location. 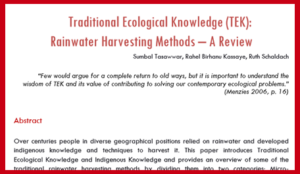 Over centuries, people in diverse geographical positions relied on rainwater and developed indigenous knowledge and techniques to harvest rainwater. 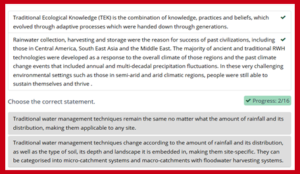 These can be divided into these categories: Micro-catchment methods, Macro-catchment and Flood-water methods. Traditional Rainwater Harvesting is a process that requires the concentration, collection and storage of rainwater for a number of purposes. This can be done in the same area where the rainfall takes place, or in a different area. This water can also be used immediately or later. 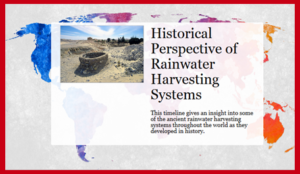 Some examples of traditional rainwater harvesting include qanats, contour-bench terracing, spate irrigation, khuskhaba system, rooftop rainfall collection and cisterns. Traditional methods may have a few challenges to overcome, but they have proven to be sustainable over long time periods. 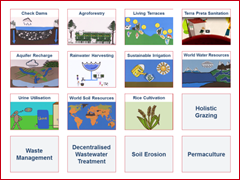 In order to fight environmental degradation of the present and future, it is important to develop holistic and sustainable strategies, especially in vulnerable regions. Click on the elements below for more information! 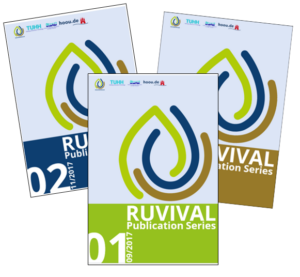 For a more general overview and introduction to rainwater harvesting, please check out the Toolbox on Rainwater Harvesting. 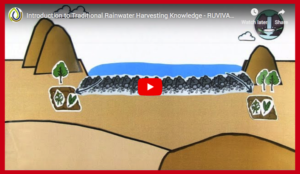 Further information on practical applications is given in the Land-based Rainwater Harvesting Toolbox, as well as the one on Aquifer Recharge, which provides you with knowledge on how depleted groundwater sources (aquifers) can be restored. In the meantime, if you would like to learn more about rural development, please take a further look at our website. Please keep in mind that new materials are available weekly.